1. 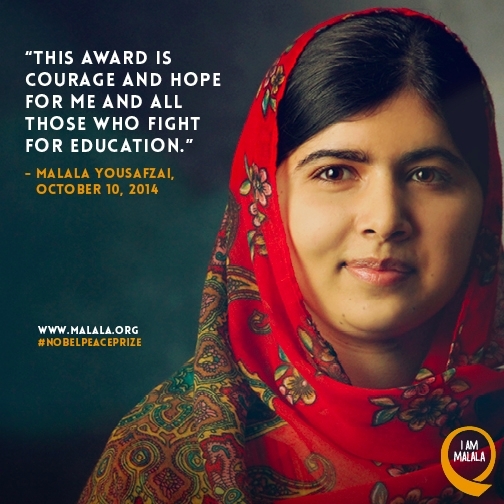 Malala wins the Nobel Peace Prize!!! 1) Malala wins Nobel Peace Prize!!! I want to share this message with all of you you fight for education in East Ramapo. This is courage and hope for all of us. Her full comments: Today, I was honoured to learn I will receive the Nobel Peace Prize. I am proud I am the first young person and first Pakistani to win this prize. It is an honour I share with Kailash Satyarthi — a hero in the fight for children globally. More than ever, our world needs more heroes like Kailash. I believe they did this because they believe we are #StrongerThan any challenge. We are #StrongerThan fear. This award is courage and hope for me and all those who fight for education. When I found out that I won today when I was in school, studying Chemistry. I told my teacher I needed to finish my school assignment. Education is my top priority. I was learning with my friends, where I believe every child should be. But 57 million of them are still out school. We still have a lot to do. The road to education, peace and equality is very long. But I know millions of children are walking beside me. If we go together, we will achieve our goals and we will complete our journey. We have to walk together. I am honoured to walk this road with Kailash. I am honoured to walk it with you. Superintendent Klein has made comments which are offensive to immigrants. He has failed to apologize. No school board member has called on him to apologize. Now we must call for his resignation. We will continue the protest on October 21st. Superintendente Klein ha hecho comentarios que son ofensivos para los inmigrantes. Ha fallado a disculparse. Ningún miembro de la junta escolar ha hecho un llamado a él para pedir disculpas. Ahora tenemos que pedir su dimisión. Vamos a continuar la protesta el 21 de octubre. EAST RAMAPO, written by Mark Judelson, is a dramatic series of monologues and conversations of individuals directly involved in the East Ramapo Central School District. The evening will begin with a conversation facilitated by internationally known facilitator Roberta Wall (steps2peace.com) about the issues surrounding our school district. Using the principles of Nonviolent Communication ( wwww.cnvc.org ) Roberta will guide us in a model of conversation and small group processes that are meant to create connection around each point of view and the humanity of each speaker. This model will lay the basis for continuing a new type of conversation and connection among all of us. A special performance of East Ramapo will follow. A community Forum on the Pros and Cons of a ward system for Ramapo. Sponsored by Wake Up Rockland. Come out to lean the Who, Why, Where, When and How of the Yes-Yes and the No-No vote on the referendum!!! Hear from all sides of the debate, plus experts in the field. And you thought politics was boring!! !